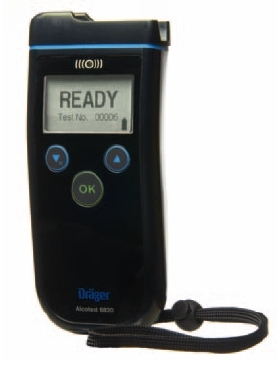 The Drager Alcotest 6820 is a compact handheld measuring instrument and the logical successor to the successful Alcotest 6810. Adaptable to international guidelines, the Alcotest 6820 is quickly ready for use and has an even more sturdy enclosure. HIGH-QUALITY WORKMANSHIP - Withstanding some abuse is important for any professional alcohol breath testing equipment. The Drager Alcotest 6820 is ideal for demanding conditions, as it has a new design and is built with quality workmanship. Protection class IP 54 is met by the Alcotest 6820 and rough weather conditions including moisture and cold are not an issue due to the unit's durable material. HIGH USER COMFORT - The Drager Alcotest 6820 has been designed easy to use, with all measuring functions controlled by just a single button. This is vital, as high levels of concentration are required when testing intoxicated people. A large, backlit display shows the user full text messages that are easy to read, which will guide them easily through the alcohol testing procedure. Acoustic signals and an LED display support the information displayed visually and also help report when a test measurement has been completed. Navigation and the collection of statistical data can be achieved using just two menu buttons. PROVEN QUALITY - The proven electrochemical Drager sensor has been equipped on the Alcotest 6820. Portable and durable, this sensor is characterised by very short response times. Whether the temperature is -5 °C or +50 °C, the test results are always reliable. Even with a high alcohol content, the sensor provides fast accurate results. And this is true for both active as well as passive measurements. PRACTICAL DESIGN - Alcotest 6820 offers a balanced, ergonomic design. Its compact form makes it especially easy to hold and operate with only one hand. The mouthpiece of the Alcotest 6820 unit is easily snapped into the holder even when it's dark thanks to its intuitive shape - regardless whether you are right-handed or left-handed or whether testing traffic moving on the right or left side of the road. The display is always in clear view. After use, the mouthpiece is just as easily and hygienically removed again. "SLIDE 'N' CLICK" MOUTHPIECE - The patented Drager mouthpieces prevent any manipulation attempts. The optional return valve simultaneously ensures maximum hygiene. Alcotest 6820 uses the same reliable mouthpieces such as Alcotest models 6510 and 6810. DATA PROCESSING AND DOCUMENTATION - The expanded memory capacity of Alcotest 6820 is able to record up to 5000 test results. An optical interface enables wireless transmission of data to the Drager mobile printer directly on site. Data is transferable to the PC via USB connection and the same connection can be used to configure the device. OPTIONAL ACCESSORIES - A wide strap supports safe and comfortable use of the Alcotest 6820 testing device. The strap can be attached to your belt or around the wrist and secured with either buckles or Velcro. Reflectors make it easier to locate the device in the dark.